A collection of images connected with Veterans Day. Images include males and females from five branches of the military: air force, coast guard, marines, navy and army. 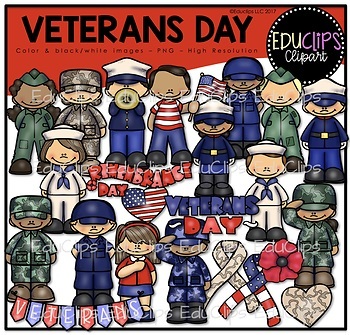 The set also contains a boy playing a bugle, boy with US flag, girl with hand on heart, poppy, hearts & ribbons (flag and camouflage), veterans bunting and word art. This set has been completely updated on 10/30/15.